They say Men are from Mars and Women are from Venus – I’m not entirely sure who said that, but I’m sure it’s someone classy and famous. Time to learn all about Venus boys and girls! See this? 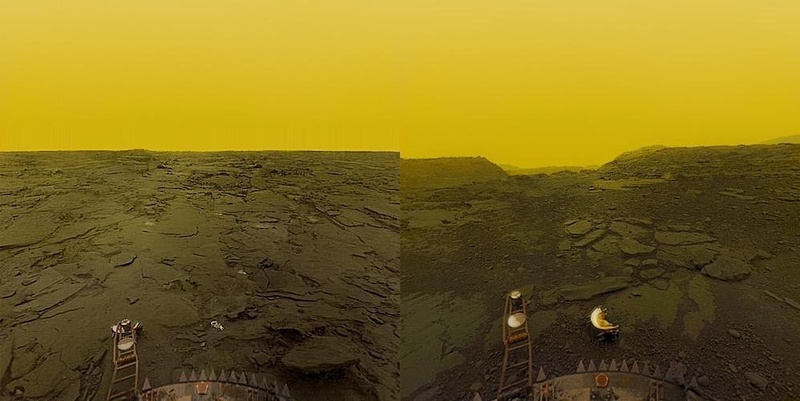 This is the surface of Venus. Digitally touched up and colour corrected of course, as this picture is actually over 30 years old. More on this later. First, let’s go back in time to when Russia wasn’t Russia. Back before the collapse of the USSR, before losing the space race to the Moon to the USA, they had their sights on a competition-free space achievement. Since the Voyager probes had not been launched yet, no one knew of the outer planets in detail enough to consider what we now know as possible areas for life (Europa for example). 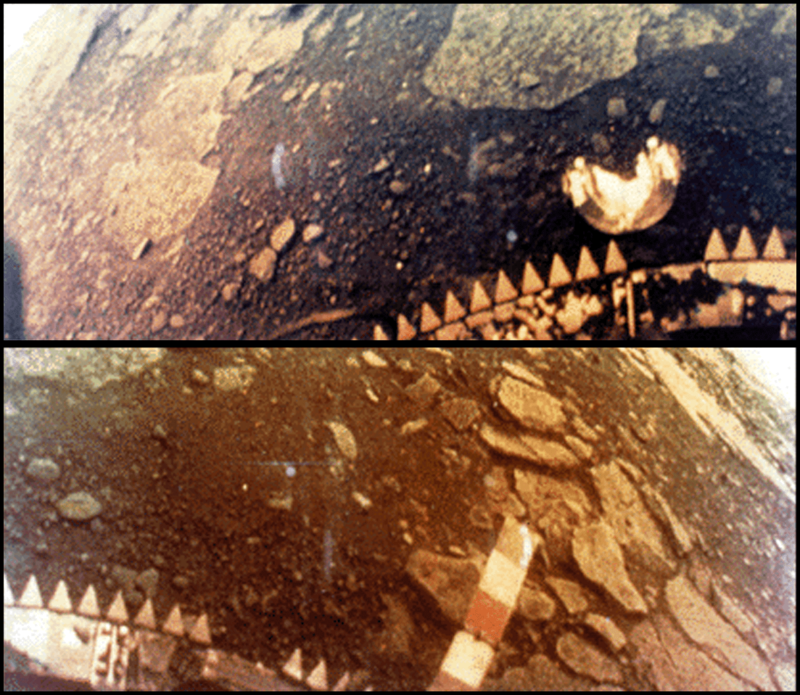 The USSR decided to go to the next closest neighbor to Earth, which is Venus. Back in the early 1700’s, it was discovered that Venus had a thick atmosphere, observable from light scattering off of the surface, giving a “halo” type effect when viewed from ground based telescopes. It wasn’t until the 1920s when Astronomers discovered that the atmosphere was thick and yellowish, which dissipated much of the light, giving what was surmised as a dark, no-light surface. Still no talk of the environment here, so enter the USA with it’s 2nd attempt at a fly-by mission called Mariner 2 to blast the planet with Microwave and Infrared radiometers. It revealed that the clouds themselves were not substantially hot, but the surface of the planet was measured at a whopping average of 425 degrees Celsius! With no magnetic field, and no radiation belts, it was determined that life could not exist on the surface, and was since written off as a planet to explore by NASA. 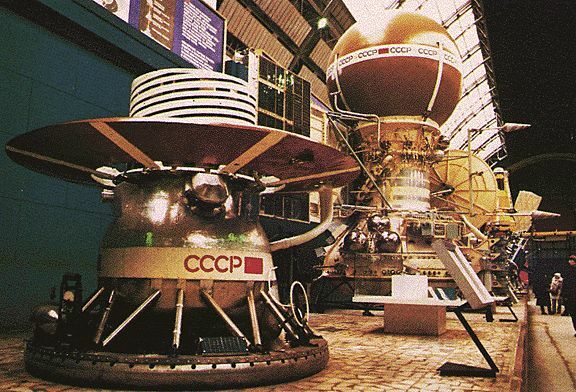 Fast forward a few failed and successful probes, and enter the USSR’s Vega missions. One failed (Vega 1) but the other, a balloon suspended robot hovered for roughly 40-50 hours in the upper atmosphere of Venus, reporting that the temperature and pressure were similar to Earth’s surface temperature. Since Earth air is buoyant compared to Venus air, what you’re currently breathing now acts like Helium does on Earth, it floats away. Wrap that up in a balloon and you’ve got an air powered balloon without the requirement to pack precious Helium along for a 150 day journey. See, the problem is not just the temperature. We have and had materials back then that could withstand thousands of degrees of temperature, and we had ways of cooling sensitive parts in hot climates. The problem is landing a probe. With some basic astrophysics calculations, no craters are smaller than 3km on the surface due to the atmosphere being so dense to incoming objects, and nothing less than 50m in diameter will ever strike the surface (excluding man-made objects). But wait, there’s more, call now and get the most corrosive atmosphere known to exist in the solar system! Next on the chopping block is metal. Anything metal, including those currently protected with coatings on Earth from acid and corrosion stands no chance on Venus. It’s inhospitable acid-filled atmosphere and temperature make any metal almost unusable by the time it gets to the surface. One exposed screw or staple on an all plastic probe is now destroyed. One spec of copper during the manufacturing of a specific tool compromises the entire probe. Shown below is the colour of Venera 13. See how badly corroded this probe is already (The black splotches on the spikey ring)? The shots were taken and transmitted in black and white, so any colour shown above or below is artist rendition of samples and research data collected and assumed. Below is the same as above, but not touched up by anyone – these are what it would’ve looked like had the camera’s been colour capable. Oh you’re not that big.. Tidal Forces are destroying the Earth!